Jesus may return to Earth tomorrow, a hundred years from now, or any other day, but it is unlikely to be this Saturday, May 21st- a day when the Family Radio organization expects His return. The reason is simple: The Bible says in Matthew 24:36 and Mark 13:32 that no one knows the day or hour of the Lord’s return, not angels or anyone else, but the God the Father. 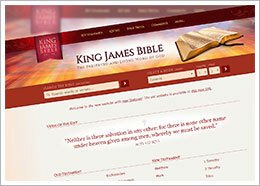 LONGVIEW, Wash. – King James Bible Online (www.kingjamesbibleonline.org), a website inviting its visitors to read the Bible online, celebrates 3 million visits since being founded in November 2007. This milestone coincides with the 400 year anniversary of the King James Version, first published in 1611 in England under the direction of King James I.